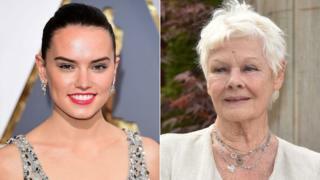 Dame Judi Dench and Star Wars actress Daisy Ridley form part of Sir Kenneth Branagh's starry cast in his new film of Murder on the Orient Express. Johnny Depp, Michelle Pfeiffer, Michael Pena and Sir Derek Jacobi will also have roles in the latest adaptation of Agatha Christie's 1934 mystery novel. Other cast members include Leslie Odom Jr, the Tony-winning star of Broadway musical Hamilton. Sir Kenneth will both direct and star as Belgian sleuth Hercule Poirot. "I'm honoured to have this fantastic group of actors bring these dark materials to life for a new audience," said the film-maker. Production begins in November in London. Previously filmed in 1974 with Albert Finney as Poirot, Murder on the Orient Express sees him investigate the death of a wealthy American on board the titular locomotive. Depp plays the victim Samuel Ratchett, while Dame Judi plays the aristocratic Princess Dragomiroff. Ridley will play Mary Debenham, a working-class governess in love with Odom Jr's Dr Arbuthnot. Other roles will be played by Jekyll and Hyde star Tom Bateman and Lucy Boynton, recently seen in the Irish film Sing Street. Ingrid Bergman won an Oscar for her role in the 1974 film, which also featured Sean Connery, John Gielgud and Vanessa Redgrave. The story also inspired a 2010 instalment of ITV's Poirot series, starring David Suchet as Christie's famous detective. Follow us on Twitter @BBCNewsEnts, on Instagram at bbcnewsents, or if you have a story suggestion email entertainment.news@bbc.co.uk.